When you got married, you probably expected it to be the beginning of a wonderful new life, sharing lots of time together in harmonious bliss. And it probably was...until the honeymoon ended. Then a couple of things may have gotten in the way--your jobs! Most couples get married to be together. But separate careers often keep them apart much of the time. It's almost as though they live different lives--each with their own work, objectives, challenges, triumphs, and friendships. They climb the ladder of success, striving to make a better life but their jobs often become even more consuming--frequently leading to friction, unhappiness, and even divorce. The New In Business And In Love introduces you to what many couples have found to be the best way to make their marriages stronger and more meaningful--working together as a synergistic team. Operating a home-based business can give your marriage and the rest of your life a whole new enriching dimension that you simply can’t get any other way. Leaving their corporate careers behind, authors Chuck and Aprill Jones discovered all of this firsthand, experiencing increased success and happiness by working at home. Learn how you can do it, too, as they candidly reveal the secrets of how they worked together to build their business--strengthening their marriage while creating a freer, more rewarding lifestyle. ● Four basic ways to get started. ● Handling finances without going emotionally broke. ● Making style differences work for you. ● How shared objectives produce happier marriages. ● Bringing children into the business...and much more. 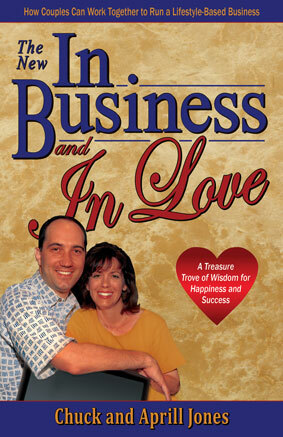 The New In Business and In Love is a must -read if you've ever thought about enhancing your life by really living it together---at work and at play!